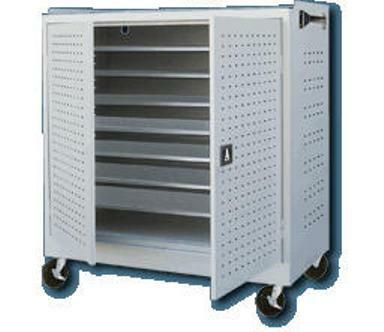 Learn more about A Plus Warehouse laptop lockers. The laptop security locker is found under the laptop locker section. 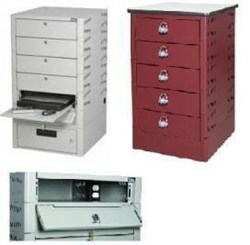 Other items in this section include wall-mounted laptop locker and mobile laptop security cabinets. As Ed mentioned, many different groups benefit from laptop lockers including corporations and schools. It is important to store laptops in a secure location. Nothing does this job better than laptop lockers. Without these lockers, it is likely that a person may get all of their data stolen. Often times people have their whole lives on their laptop. Obviously, having it stolen will cause major problems. The laptop security locker is shipped fully set for convenience. It can be frustrating to try to set up a product, so leave it to the professionals! Many options are also available with this locker. Customers choose between 5 and 12 openings. Customers can also choose to have the locker charging or non-charging. This item locks with a padlock hasp, key locks, or electronic locks. This decision is completely up to the customer. If a customer chooses electronic, however, locks have a 4-digit code. It should be noted that this product also comes in a rainbow of colors. These colors include sage, slate blue, burgundy, tech blue, tan metallic, light gray metallic, medium gray metallic, dark gray metallic, soft white, bone white, ivory, light gray, dove gray, gray mist, warm brown, and black. These are all beautiful colors that are visible in the company's color chart. 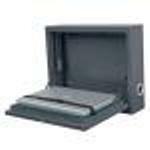 Customers should order the laptop security locker today.